With the River Kings back on their home turf, they’re looking to get their first win after rebranding the team in the offseason. After a loss to the Arizona Rattlers, Cedar Rapids takes on the Strike Force of San Diego this Saturday, March 9 at 7:05 PM CST. Quarterback Kurt Palandech had another positive game in Week 2. As a dual threat quarterback, he looks like he can have a good performance through both the air and on the ground, as he has been able to do so against a couple highly accredited defenses. Palandech was able to complete about 55% of his passes (15-27) for 114 yards, two touchdowns, and had one interception. While performing well with his arm, his legs were also a danger to the Rattlers defense; he rushed seven times for 42 yards and a touchdown. Running back Nate Chavious was able to rack up 89 yards on 16 rushes, which resulted in a touchdown. He continues to be the major producer in the ground game, alongside Palandech. Marquel Wade, although not as impressive of a game as Week 1, was able to find the endzone once while reeling in five passes for 41 yards. Cedar Rapids hopes to have a game more like Week 1 in their meeting with the Strike Force from Wade. Defensively, the River Kings could not keep Arizona out of the endzone. One of the more positive stats to come from the performance against the Rattlers was Malik Slater’s performance. He was able to come away with with seven tackles, three of which being solo, putting him up to 12 total tackles on the season. The Strike Force will need to find a way to stop him if they want to have success on offense. As for San Diego’s season so far, they, too, sit at 0-2. Their game against the Tucson Sugar Skulls was a high-scoring affair, with Tucson ultimately ending up on top 64-44. Their passing game had its ups and downs. Quarterback Derrick Bernard completed roughly 47% of his passes (19-40) for 179 yards, three touchdowns, and two interceptions. With 40 attempts in the air, it will be interesting to see if San Diego has a similar offensive scheme drawn up to combat the River Kings’ defense. There were not many long runs for Running Back George Moreira Jr. He did not seem to be a major part of the drawn up scheme for their Week 2 matchup against Tucson, as he only rushed the ball four time for 18 yards. That being said, he did turn two of those rushes into touchdowns. Marquies Rodgers (six receptions for 82 yards) and Julian Stafford (eight receptions for 53 yards and a touchdown) seemed to be the main to targets for San Diego. The rest of the team accounted for only five receptions. 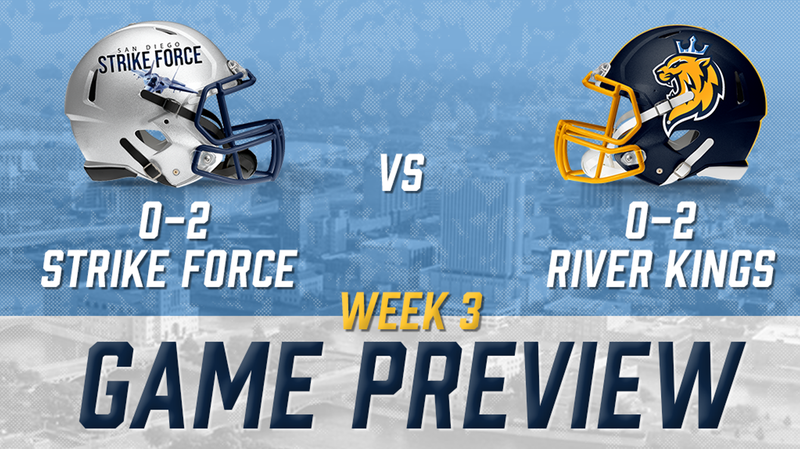 With the run game being absent in Week 2 for the Strike Force, it seems like their offense will rely on their ability to score through the air in the Week 3 Matchup against the River Kings. Defensively, the Strike Force got all bodies to the ball resulting in 45 tackles, much more than the River Kings’ 23 total tackles. Their main contributions came from Defensive Back Timothy Moten (3 solo tackles and 4 assisted tackles) and Linebacker Lonnie Bickham (3 solo tackles, 4 assisted tackles, and a forced fumble). This should be an interesting game for the two 0-2 teams. Both of which have shown glimpses of success, but neither have been able to celebrate the first win of the 2019 season. 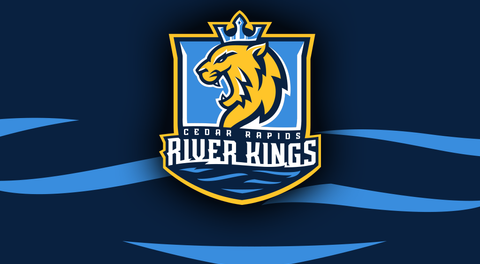 The game between the River Kings and Strike Force will be on Saturday, March 9 at 7:05pm CST at the US Cellular Center in Cedar Rapids. Tickets can be found on the River Kings Website, and the game will be livestreamed on the IFL’s YouTube page, which you can find by clicking here.